If you’ve really gotten into pour over coffee, you’ll realize how important a good pouring technique is in extracting a clean, flavorful, and rich cup of coffee. And in order to attain better pour over skills, you really need to use a pour over coffee kettle. Pour over coffee kettles are designed with a gooseneck spout that allows precise control over the flow of water onto the coffee grounds, so that you can adjust the volume, speed, and turbulence of your pour. This is why they are also called best gooseneck kettles. Other popular names include hand drip coffee kettle or cold brew coffee kettle. With so many pour over coffee kettles brands, you’re probably wondering: what’s the difference between all these? Can’t I simply get any kettle with a gooseneck spout? Well, we’re guessing you want a pour over coffee kettle that will last through repeated everyday use and won’t rust or fall apart. There are also different sizes and functions to consider, so here’s our pour over kettle comparison for different needs. The Bonavita Electric pour over coffee kettle is what we usually recommend to coffee geeks – it’s simply wonderfully versatile and with so many features, well worth the price. What we love about the Bonavita Electric pour over coffee kettle is simply that it’s so multifunctional, integrating a number of tools into one single unit. Not only does it heat your water up to the desired temperature, it keeps the water at that temperature so you don’t have to fumble around with thermometers, re-heating, and whatnot – especially if you’re making more than a single round of pour over coffee. You can even do away with a timer since this includes a timer as well. For a pour over coffee setup with the smallest counter footprint, get this Bonavita kettle, your dripper on the Hario pour over coffee stand + scale, and a coffee grinder. That’s it! 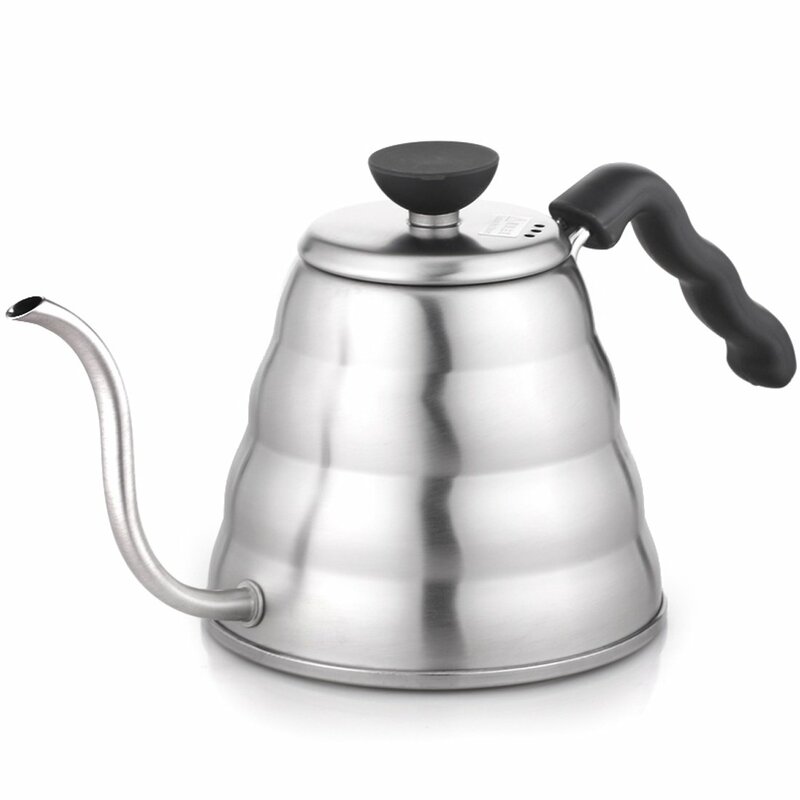 The Fino pour over coffee kettle is the perfect compact size for making coffee for two. It takes less than 2 minutes to boil on the stove and is really well-made – in fact, out of all the stovetop pour over coffee kettles we’ve tried, the Fino really feels like the most solid one. Compared to the other pour over coffee kettles we’ve tested, the Fino is the only one that hasn’t lost its shine, while some others have even started to show signs of rust after a few months of use. This is impressive considering we live in a humid climate. However, if you’re brewing coffee more frequently, the Fino pour over coffee kettle may be too small for your needs. This is the benchmark pour over coffee kettle for most baristas, as with many other types of coffee equipment. Hario sets the standard for coffee equipment, and we believe the Buono is the best pour over coffee kettle for more advancced pour over coffee enthusiasts who are experimenting with different types of pouring techniques. Although all gooseneck kettles offer better control over the water flow than normal kettles, we really like the Hario Buono pour over coffee kettle’s flow speed and control. Even a slight change in the tilt angle produces a response in the water flow, making it great for experimentation with brew times and with pulse brewing. This can be attributed to the lower placement of the spout (which also means less remaining water pooled at the bottom of the kettle). The Hario Buono pour over coffee kettle also holds enough water for 3-4 cups of pour over coffee, so it’s perfect for station brewing. The shape of the kettle and the design of the lid makes the insides slightly difficult to clean, but if you make your coffee with filtered water (as you should!) then sediment from hard water should not be an issue at all. Make sure it’s made of good, hard stainless steel that won’t warp or dent easily. This is especially important if you’re using it on a gas stovetop. Check the welding of the spout and handle to ensure they’re well-attached and won’t come off easily. Poor soldering may come off when subject to the high heat of a gas flame or induction stove. Test the kettle’s grip and make sure the lid isn’t loose, or it may fall off easily when the kettle is tilted for pouring.